Foundation piecing sounded fun (by now I was checking books out of the library). To try my teeth on this new technique, I created a little table topper. (bottom photo) Hey, this WAS fun and nothing could be easier! A full sized quilt was planned and fabrics acquired. Nothing quite prepared me for the length of this journey. Hours and hours of 'easy' work. Whew! 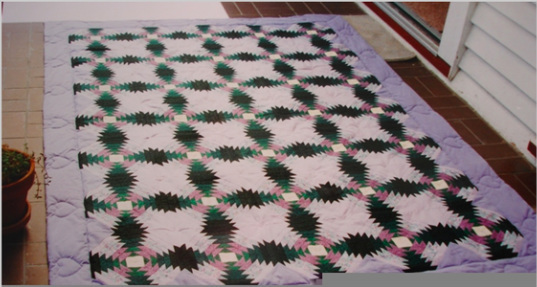 This tied quilt was a gift for my husband's grandmother who was well known for her log cabin quilts and crazy quilt cushions. 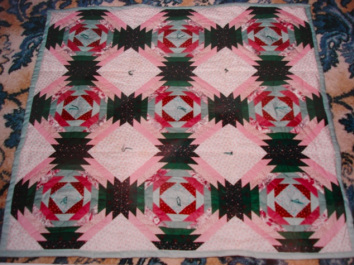 Gran refused to put it on a bed, it hung on a special dowel shelf for years and consequently is in perfect condition.